The original Limecrete Floor is a modern interpretation of a traditional solid lime or gypsum floor that can still be seen in many historic or well preserved older homes. Mike Wye & Associates offer an option for an insulated floor using an insulating clay aggregate. This can be incorporated into the slab rather than using sand and in its coated form it can be used as an effective loose lay material below the slab to help prevent capillary action pulling moisture from the ground. Increased vapour permeability, which is important in older properties. Hydraulic lime is more environmentally friendly compared to cement. 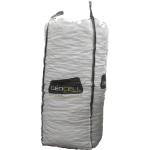 It can be designed to meet the insulation requirements of Building Regulations. PLEASE NOTE: THE MAJORITY OF LIMECRETE FLOOR SYSTEMS NOW USE FOAM GLASS AGGREGATE AS THE SUB-BASE (SUCH AS OUR GLASSCRETE FLOOR). LIMECRETE FLOORS USING CLAY AGGREGATE CAN STILL BE BENEFICIAL FOR SMALL PROJECTS OR WHERE A WACKER PLATE CANNOT BE USED. 100 mm-500 mm layer of loose fill 10-20 mm coated clay insulation. 100 mm-150 mm Limecrete slab, 3 parts un-coated clay aggregate 1 part NHL5 (by volume) with 30 mm Cork Board to external perimeter walls. 75mm screed of 2 parts aggregate 1 part NHL5 (to bed heating pipes if included). 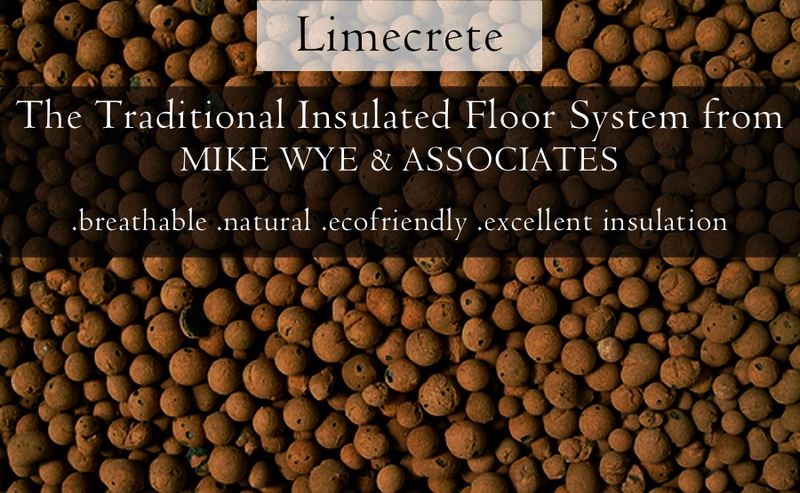 Mike Wye Limecrete is an LABC registered floor systems. Need material quantities and insulation U-values? We take the necessary information and will work it out for you. We will calculate all the design information you need for your floor, thicknesses, insulation values etc using our accredited design programme. 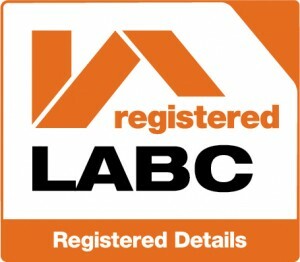 As well as providing quotations, including delivery, for all the components. Expanded clay aggregate consists of lightweight, porous, ceramic granules formed by expanding special clay at high temperatures. The coated version of the aggregate is free-draining and has negative capillary action, good load-bearing properties and good thermal qualities (k = 0.10 W/mK), and is used as an insulating layer below the limecrete slab. This is a vital part of the build-up of a limecrete floor, offering an effective vapour permeable barrier to excessive moisture levels. 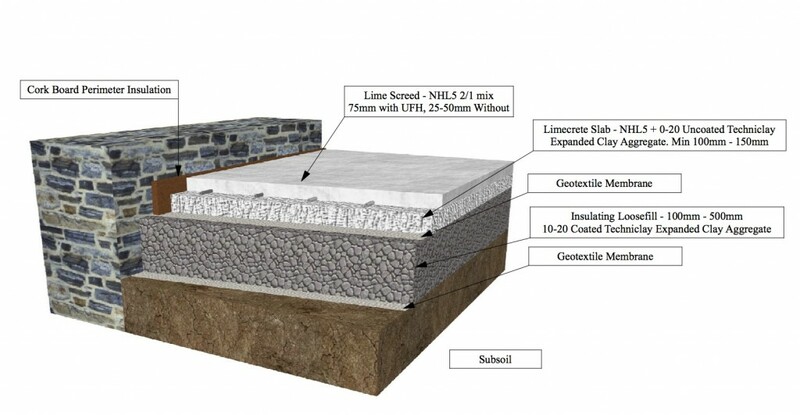 The un-coated aggregate is mixed with NHL5 to form a limecrete slab. 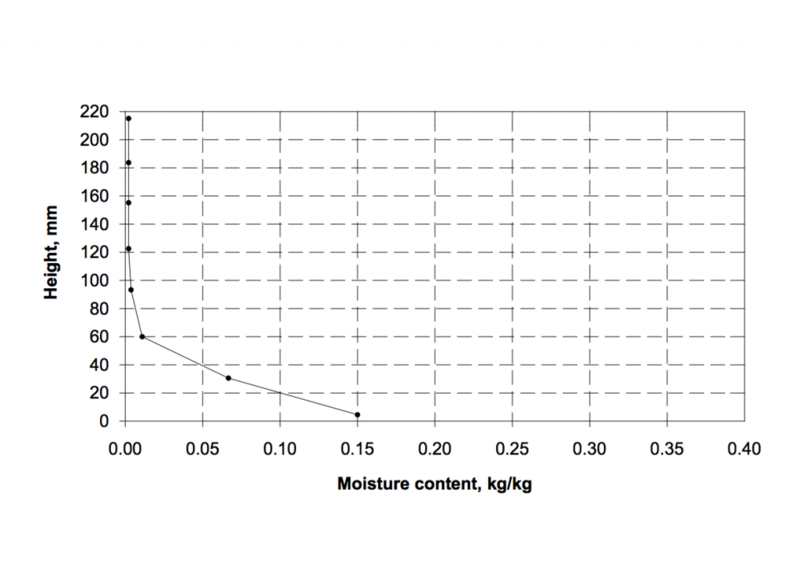 The graph below shows represents simple test on moisture absorption and forms the basis for a minimum of 120 mm of loose fill material for an effective capillary break. We believe these will offer an excellent and cost effective option for those wanting to use powdered hydraulic limes in their work. Secil NHL5 is fast setting and ideal for limecrete floors whether used with sand aggregates or insulating aggregate such as ‘light expanded clay aggregate’. Use NHL5 for limecrete floor systems.